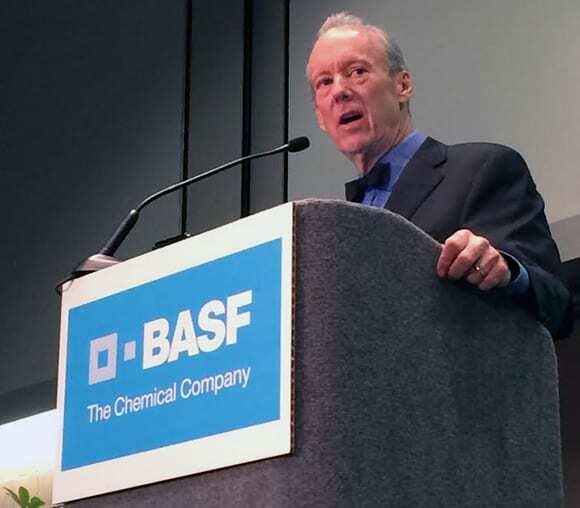 On Tuesday, October 21, William McDonough delivered the 2014 Materials & Human Health Summit Keynote titled Material Health: Authentic Transparency and Optimization. 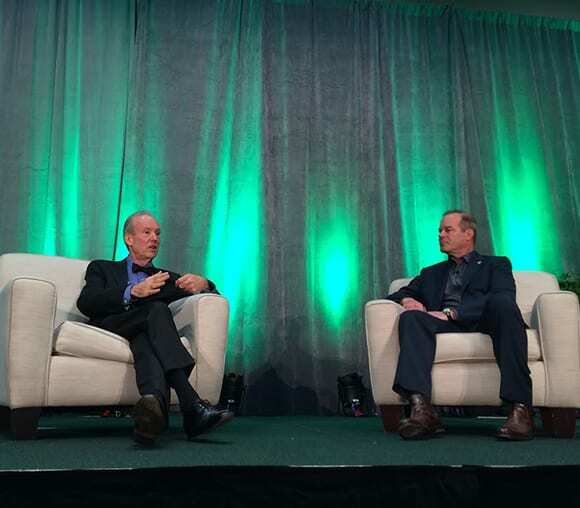 The Opening Plenary address was followed by a conversation between McDonough and USGBC’s Scot Horst on the importance of deep transparency and why material health is about much more than materials. That same day at the Materials & Human Health Summit, Stacy Glass, Vice President of the Cradle to Cradle Products Innovation Institute, joined program operators representing Health Product Declaration Collaborative, UL Environment, Clean Production Action Network (creators of GreenScreen) and USGBC to present State of the Market: LEED v4 and Materials. 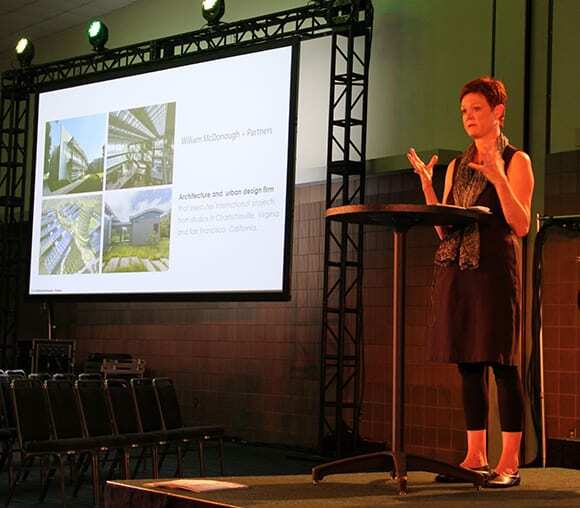 On Wednesday, October 22, Bridgett Luther, President of the Cradle to Cradle Products Innovation Institute, was joined by leaders from Shaw Flooring and AGC Glass to present Quantifying the Impacts of Regenerative Product Design. The session addressed the question: What are the quantifiable impacts of regenerative product design on business, society and the environment? The results offer insight for an industry exploring new measures for products based on material health, material reutilization, social fairness, and other factors. 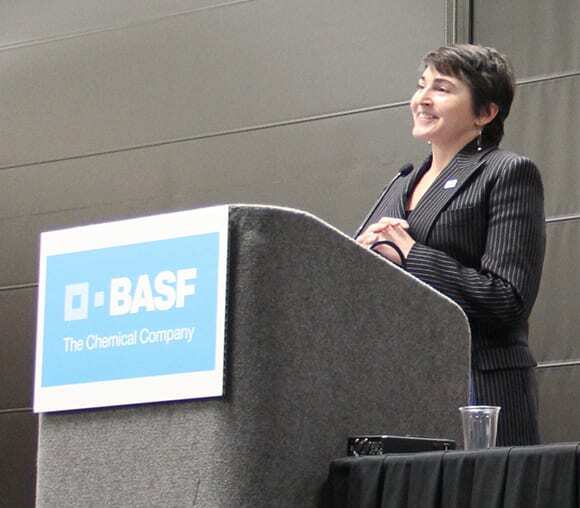 Also on Wednesday, October 22, two leading environmental chemists in the field of material health Susan Klosterhaus, Ph.D., Vice President of Science and Certification at the Cradle to Cradle Products Innovation Institute, and Lauren Heine, Ph.D., Clean Production Action, presented a session titled: Demystifying Material Health Assessment: The Path to Better Products. Kira Gould, Director of Communications for William McDonough + Partners, and Susan Szenasy, Publisher / Editor in Chief of Metropolis magazine, were joined by Sandi Stroud, Urban Focus; Collette Creppell, Eskew + Dumez + Ripple; Flozell Daniels, Foundation for Louisiana; and Jonathan Leit, Alembic Community Development, to address how we can design communities to be supportive of robust food systems, resilience, mobility, access, employment, housing for all, and adaptability. The group’s discussions explored how communities can encourage “learning” in this session titled: Health Matters: Designing Communities That Learn. Kira Gould (who is also co-author of Women in Green: Voices of Sustainable Design) also served as an honorary chair and table host for the annual Women in Green Power Breakfast on Thursday, October 23. The breakfast brings together leaders and emerging leaders in green building to encourage, mentor, and motivate. On Friday, October 24, Jay Bolus, Technical Director at MBDC, a Cradle to Cradle Accredited Assessment Body, and Howard Williams from Construction Specialties presented a session titled: Eliminating Top 5 Chemicals of Concern. MBDC, the leading Accredited Assessor for the Cradle to Cradle Certified Products Program, met with architects, developers, designers, product manufacturers and more throughout the week at their booth to discuss how their services can help earn the new LEED v4 Materials Ingredients credits, and how Cradle to Cradle Materials Assessments and Certification can lead to a safe, healthy product. 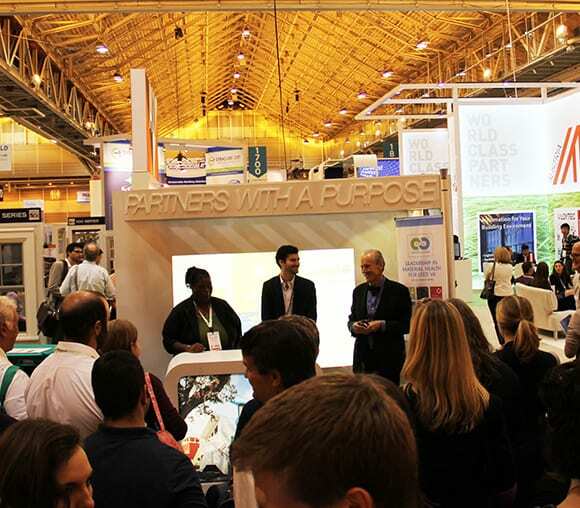 The Cradle to Cradle Products Innovation Institute could be identified throughout the Expo Hall with banners at booths featuring Cradle to Cradle CertifiedTM Products. The Upcycle book signing at MechoSystems. 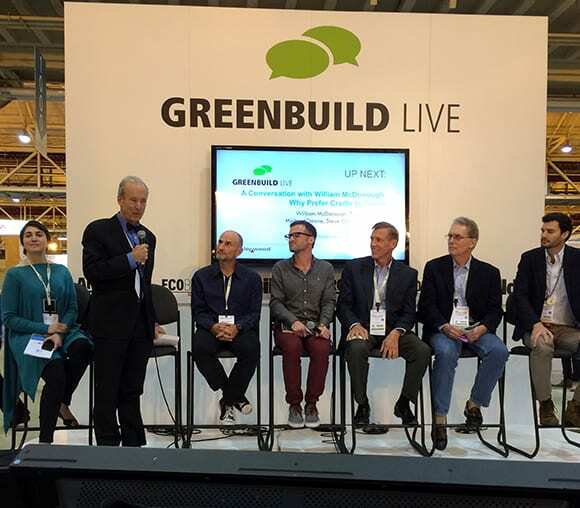 A Conversation with William McDonough: McDonough joined leaders from LivingHomes, Jones Lange LaSalle, Make It Right, Turner Construction, and Google to discuss how the Cradle to Cradle™ Certified program aligns with their business and sustainability goals, and how this alignment adds value to their clients. 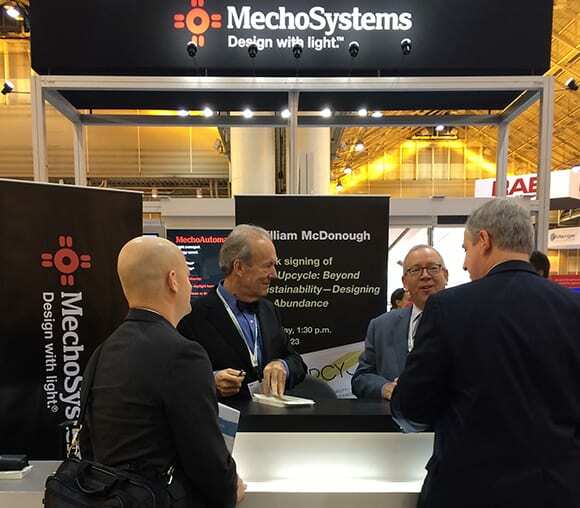 William McDonough and Tom Darden III, Executive Director of Make It Right, talked about their work together at Shaw’s booth during Happy Hour in the Hall Thursday afternoon. 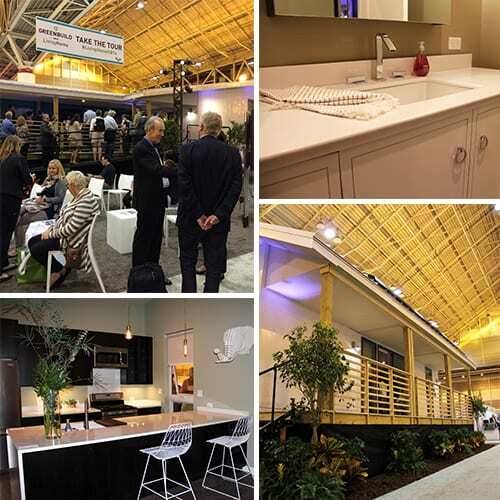 The 2014 Greenbuild LivingHome was unveiled October 22 at the Greenbuild Expo. 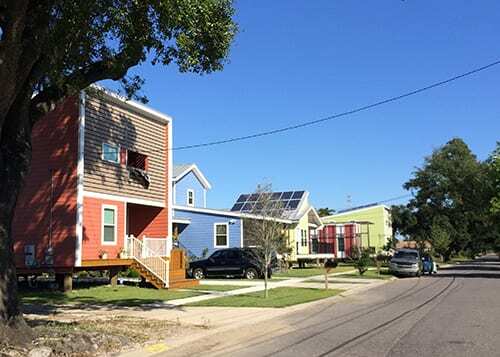 Aiming to be the first LEED v4 Platinum home, and created in collaboration with LivingHomes, Make It Right and the Cradle to Cradle Products Innovation Institute; the home was presented to the Make It Right Foundation and moved to the Lower 9th Ward in New Orleans after the conference. The 1,550 square foot, three-bedroom, two-bath modular demonstration home meets LEED® v4 Platinum requirements and showcases construction techniques and products that present exceptional sustainability, high-performance products and healthy living practices. Cradle to Cradle Certified™ product innovations are featured throughout the LivingHome including Accoya® Wood by Accsys Technologies, ECO™ by Consentino, window coverings by MechoSystems, Mosa ceramic tiles by Royal Mosa, EPIC® Hardwood Flooring by Shaw Industries, Steelcase C:SCAPE® office system & Think® chair, METHOD cleaning products and AVEDA personal care products. While in NOLA, staff members from William McDonough + Partners made a visit to Make It Right, founded by Brad Pitt and William McDonough in 2007, to build healthy homes, buildings, and communities for people in need. 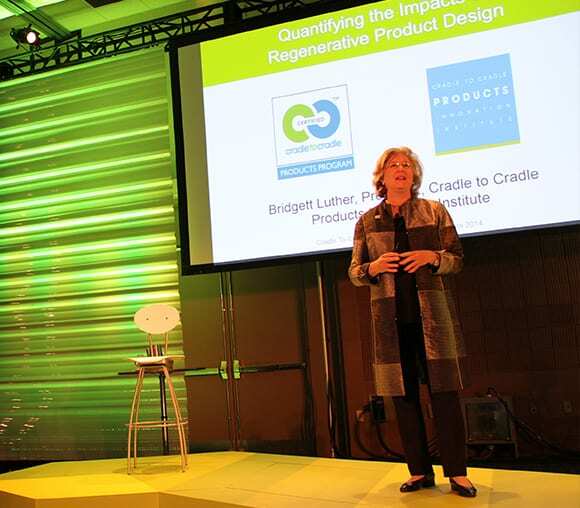 William McDonough + Partners developed criteria to frame Make It Right’s environmental mission, using Cradle to Cradle® thinking to outline design and systems performance requirements for each home, achieving the goal of LEED Platinum certification for all of the houses. The WM+P Greenbuild team walked the neighborhood, identified homes designed by architects from around the world, and was inspired by how the 100 homes built so far (50 more houses are on the way – a new groundbreaking happens each month) are helping to rebuild this community.